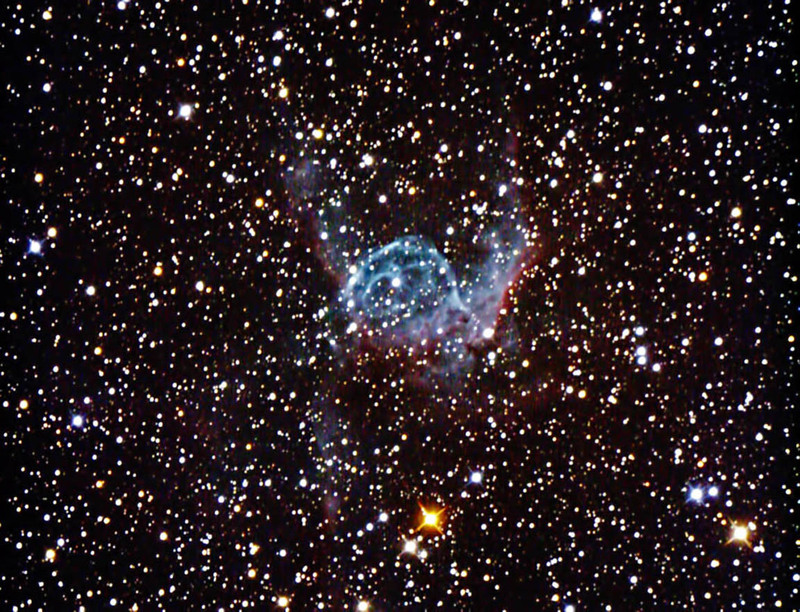 NGC 2359, due to its appearance, is commonly known as Thor's Helmet. The "helmet" part of the nebula is an interstellar bubble that is being formed by a super-hot, pre-supernova star known as a Wolf-Rayet star. Exposures: 18 @ 5 min. Note: Images were focused using the camera's Live View and converted using Canon ZoomBrowser EX. The subframes were then reduced,aligned and combined in ImagesPlus. The composite image was adjusted (Curves, Cropping) in Photoshop CS2. Finally, Grain Surgery was applied to reduce noise. Location: My backyard observatory in southeastern Minnesota (on 3/6/10). Temp. 20 F; seeing - average.